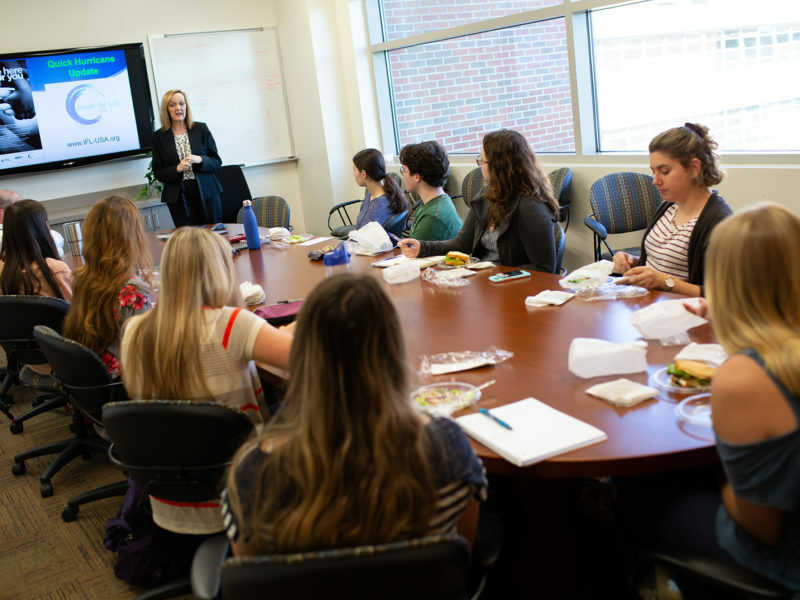 The University of Florida Diabetes Institute in Gainesville, Florida (USA) offers a two-credit course each semester which provides students with an introduction to groundbreaking research and initiatives at the institute. For many students who opt to take the course, career and academic trajectories can be impacted, and are sometimes changed altogether. Students attend because they want to know a little bit more about diabetes, and that’s usually because most all the students who participate have type 1 diabetes, or are connected to a family member with the condition. A science background is not a prerequisite, and neither is a type 1 diabetes diagnosis. However, the course is geared towards students who many have a “personal connection” to type 1 diabetes. In 2018, seven of eight students in the fall class have type 1 diabetes and the one person who doesn’t has a family member with the condition. The students meet weekly to hear from speakers who run research at UF’s work on diabetes, from Desmond Schatz, M.D., a past president of the American Diabetes Association and Medical Director of the UF Diabetes Institute, to Allison O’Kell, D.V.M., an assistant professor in the UF College of Veterinary Medicine who has done research on diabetes in dogs. Mollie Huber, who took the class as a senior microbiology major in 2018 and is now in the biomedical sciences Ph.D. program, has been living with Type 1 diabetes since age 5. Her brother, Sam Huber, now a sophomore, also has the disease and took the class with his sister. Mollie credits the class with solidifying her desire to make a career in diabetes research and one day examine the genetic underpinnings of the disease. Director of the UF Diabetes Institute, Mark Atkinson has created a program that connects influential individuals in diabetes and health sciences research, education and patient care with outstanding persons working in food systems, policy, family and youth sciences, engineering, the arts, and more. The goal is to share information, ideas and resources, and to disrupt traditional institutional models, building a community focused on making an impact on the lives of people touched by diabetes. The University of Florida is widely considered to be among the top five in the nation for type 1 diabetes research and is a leader in clinical trials seeking to prevent or reverse the disease and has been remarkably successful in acquiring competitive research grant funding.